Recently, I’ve been looking back through my ever growing pile of unfinished games to find what was left behind. And although I wasn’t much interested when I first played, Sunset Overdrive has been surprisingly enjoyable the second time around. With a colorful blend of action and the sort of annoying characters that you can’t help but love, Sunset Overdrive feels like the secret mother to Watch_Dogs’ much more imaginative sequel. That’s not to say that Sunset and Watch_Dogs 2 feel very similar, as the latter draws most of the gameplay elements from its predecessor, but their tone feels uniquely parallel. Leaving the drab Aiden Pearce behind, Watch_Dogs 2 picks up in San Francisco and follows a truly outstanding cast of characters. From the very beginning of the game, it’s clear that this is a change of direction from the original. Although the first was by no means a bad game, its mechanics and concept felt somewhat underutilized by a central character and world that refused to accept the comedy of the actions they were perpetrating. 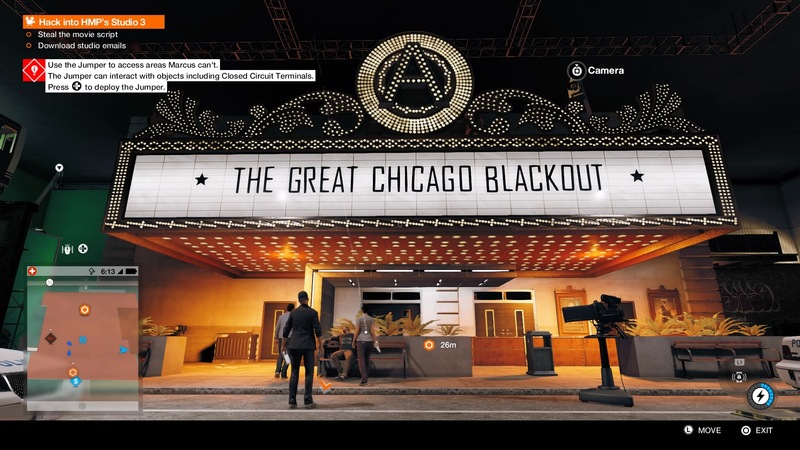 While everyone that played the original surely played jokes on the citizens of Chicago through hacking, this always felt at odds with the excessively serious tone of the game. This is the single biggest change made in Watch_Dogs 2, and truly makes the game an unmissable experience. Now the mechanics are built to be played with, from dancing in the street, to remotely hijacking cars and launching them off cliffs, the world is your playground, and much more fun to explore. But it’s not just the world that feels fresh. 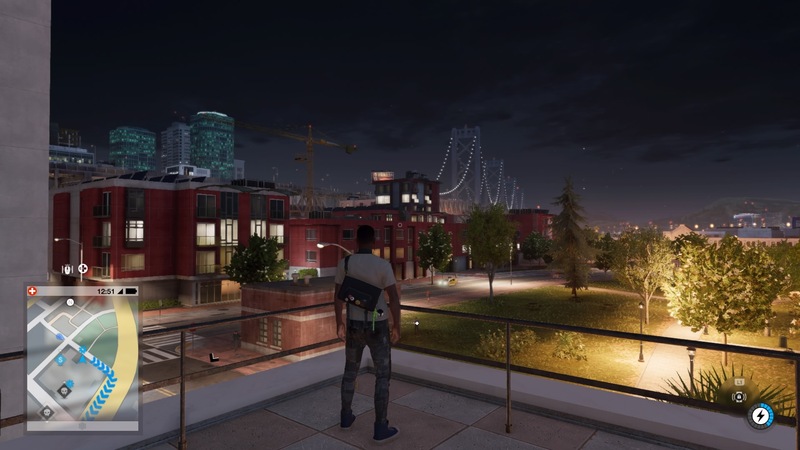 Watch_Dogs 2 and its DedSec hacker stars exploit their god-like control over the city to take down corruption and surveillance with pranks and comedy. Missions are focused on gaining attention for your group, which is done through acts of exaggerated civil disobedience. Is there a movie that mocks your hacktivist friends? Then maybe you should steal the movies props to advertise your actual powers. Is a corporation secretly selling personal data to the highest bidders? Maybe you should hack their systems live on air. Watch_Dogs 2 does an amazing job in creating the atmosphere of resistance, fighting the most powerful companies, religions and people on the planet with just a phone and laptop. This game wants to make you feel like anyone can make a difference, from the hackers at the forefront of the war, to those that support them. It also wants to make you angry. The antagonists of Watch_Dogs 2 are surprisingly relevant and immediately recognizable. Although Ubisoft sidestepped actual names and places to avoid the flurry of lawsuits, anyone reasonably tuned into the news will recognize plenty of real life villains meeting some virtual karma. Most infamously is Martin Shkreli, who raised potentially lifesaving drug prices by 4000%. 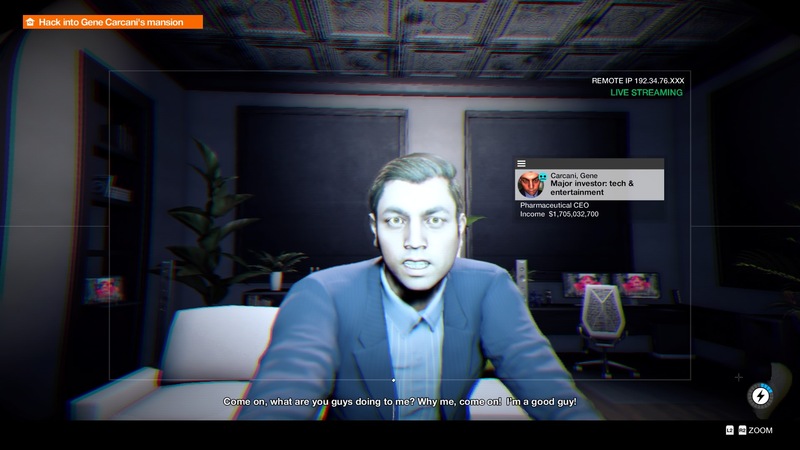 He has a Watch_Dogs 2 counterpart and seeking revenge for his misdeeds is a satisfying and hilarious experience, as you use a popular rapper to relieve the pharmaceutical CEO of some of his ill-gotten gains. Watch_Dogs 2, at its core, is the best expression of a millennial power fantasy. In an age where the Powers-That-Be may not hold a boot to your throat but they still have a spyglass to your screen, your biggest weapon is turning that power upside-down, just like in the popular TV series Mr. Robot. And there is a lot you can do in Watch_Dogs 2. Firstly, the movement system is far more in keeping with Assassin’s Creed than the original, and while you won’t be climbing up the sheer face of a skyscraper, verticality is much more of an option than in the first game. Then you have the gunplay, with a competent, fluid cover based system that is very punishing for those unlucky enough to be caught in the open. But obviously, the most fun to be had with Watch_Dogs 2 is the hacking. Now some of this can be can be as simple as using security cameras to your advantage, but your powers can be upgraded wildly and soon you’ll be able to turn robots against their masters, lock guards inside rooms and control traffic. The tutorial embedded by Ubisoft in the game is a little lacking, but this gives players the chance to experiment with the game rules and find the best way to exact vengeance on those who have failed the city. The only issue I had with Watch_Dogs 2 is its world building. While you can enjoy the subtle and not-so-subtle nods to real life events and people, some missions feel slightly under explained. From raiding locations for no given reason to controlling a massive satellite dish without clarification, you are sometimes left to wonder what the aim of certain objectives is. Dedsec will constantly be in contact and can often help contextualize these actions, but certain cases just don’t have the same accountability as the others. But this is a truly minor setback, and even when you don’t know what is going on, the gameplay itself stands up and is so deeply enjoyable that you can play almost any mission and have lots of fun. This is an open world game that like Saints Row, has come out from under Grand Theft Auto’s shadow and exists on its own. With amazing mechanics, inspired characters and some genuinely thought provoking missions, Watch_Dogs 2 should be on the Christmas list of any player that wants to fight back. Reviewed on PlayStation 4 (copy provided by the publisher). Also available on Xbox One and soon on PC. Watch_Dogs 2 is a textbook example of a great sequel. It takes what was so much fun from the first game, expands it and cuts away most of what the players didn't enjoy.